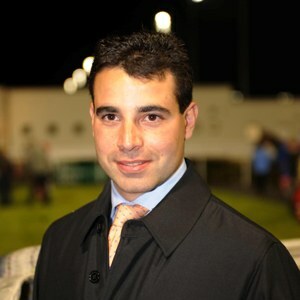 Italian-born Marco Botti is the son of Italian champion trainer Alduino Botti and worked for his father before moving to Britain, where he had spells with Luca Cumani, Ed Dunlop and Godolphin. He has also spent time in the US, working for Bill Mott. Since saddling his first winner in June 2006, he has quickly made his mark in the training ranks. A first Pattern race success came courtesy of Sesmen in the Group 3 Prestige Stakes at Goodwood in 2006, while one of the best horses to have passed through his hands is Gitano Hernando, winner of the Grade 1 Goodwood Stakes at Santa Anita, USA, in 2009. In 2011 Excelebration was his stable star, winning the German 2000 Guineas and the Group 1 Prix du Moulin de Longchamp as well as finishing runner-up to Frankel in the Queen Elizabeth II Stakes on QIPCO British Champions Day. Coolmore bought Excelebration midway through the season and he raced for Aidan O’Brien’s stable in 2012. Botti found other stable stars, however, saddling Jakalberry to win the 2012 American St Leger and finish third in the Group 1 Emirates Melbourne Cup and Joshua Tree to win the Group 1 Canadian International. He won the Amercian St Leger for second time in 2013 with Dandino, after taking over the training of the horse from James Fanshawe, and also won the Group 1 Prix Royal-Oak at Longchamp with Tac De Boistron who went on to finish a close second in the 2014 Sky Bet Yorkshire Cup. Botti hit the frame for a second time in the 2015 QIPCO British Champions Series when Suegioo stayed on well for a close-up third in the Doncaster Cup behind Pallasator and Clondaw Warrior.